I've had flour-less chocolate cake before and loved it, but it can tend to be quite heavy and rich. This egg-less cake doesn't look near as heavy but just as delicious! It looks extremely moist and definitely something I could sink my teeth into! Certainly, trust my opinion when I say it's my favorite chocolate cake!! Pin this one to make later. 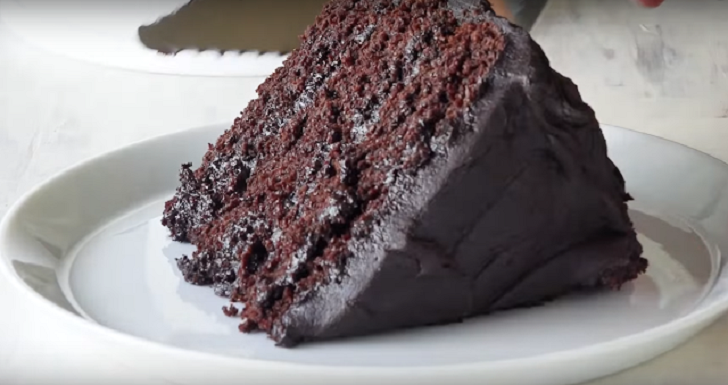 You don't need eggs to make a very moist and chocolatey cake when using this easy recipe. ⏩Preheat oven to 175°C and grease 8 in cake pan. ⏩Sift flour, soda, salt and cocoa powder in a mixing bowl. ⏩Using a whisk, combine water, oil, vinegar, sugar, and vanilla in a small bowl. ⏩Now add wet ingredients to the flour mixture, stir until you have a smooth batter. ⏩Pour into prepared pan and bake for 25-35 minutes or until a skewer inserted comes out clean. ⏩Let sit in the pan for 10 minutes before turning out to cool on wire rack.